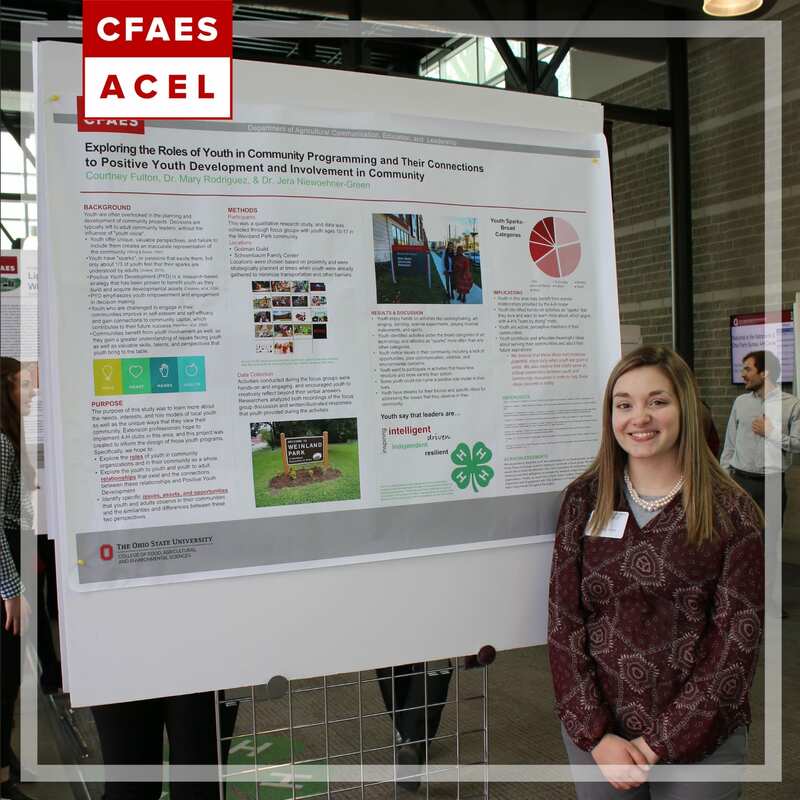 Students from the Department of Agricultural Communication, Education, and Leadership (ACEL) competed in undergraduate research forums at The Ohio State University. The University’s Richard J. and Martha D. Denman Undergraduate Research Forum on February 20 and the College of Food, Agricultural, and Environmental Sciences (CFAES) Undergraduate Research Forum on March 6. Kayla Walls, a senior studying agriscience education from Mendon, participated in both undergraduate research forums. At the Denman, she was awarded first place in the education across the human lifespan category and at the CFAES Undergraduate Research Forum, she was awarded first place in the social sciences category. 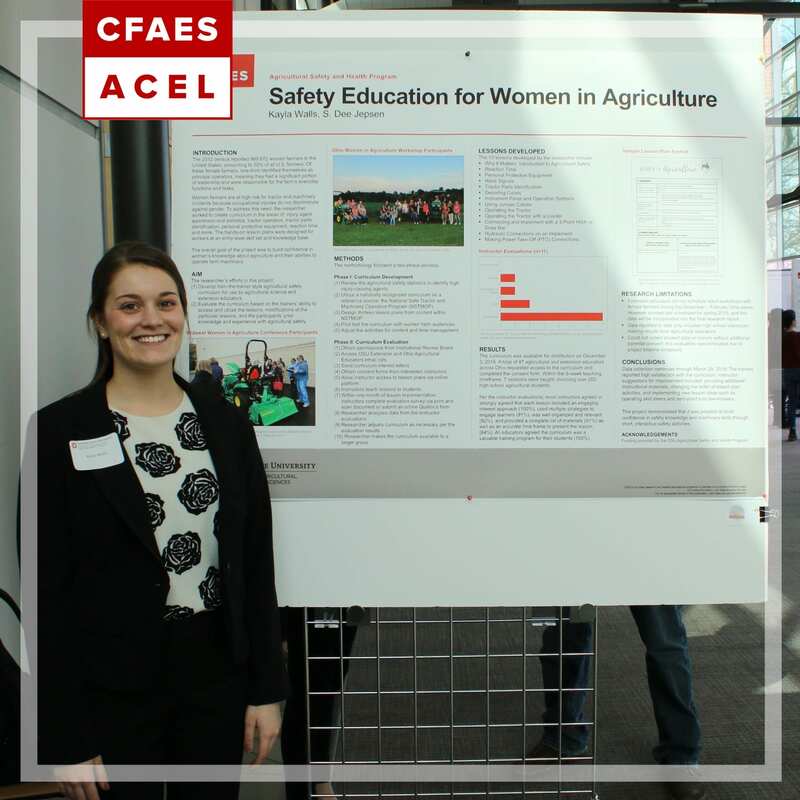 For her research project, “Safety Education for Women in Agriculture,” she was mentored by Dr. Dee Jepsen, associate professor in the Department of Food, Agriculture and Biological Engineering. Courtney Fulton, a senior studying agricultural communication from Kenton, Ohio, participated in both the Denman and the CFAES Undergraduate Research Forum. Her research project, “Exploring the Roles of youth in Community Programming and Their Connections to Positive youth Development and Involvement in Community,” was mentored by Dr. Mary Rodriguez, an associate professor of community leadership. 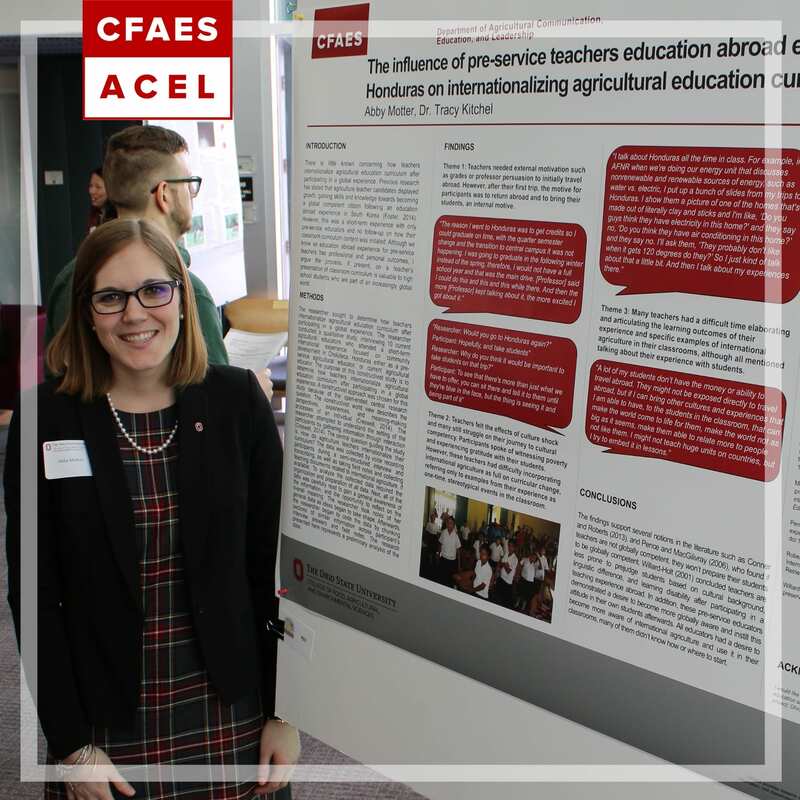 Abby Motter, a senior studying agriscience education from Mansfield, Ohio, participated in the CFAES Undergraduate Research Forum. She was awarded second place in the social sciences category for her project “The Influence of Pre-Service Teacher’s Education Abroad Experience in Choluteca, Honduras on Internationalize Agricultural Curriculum”. She was mentored by Dr. Tracy Kitchel, professor of agriscience education. The CFAES Undergraduate Research Forum provides a means for undergraduate students to share their research with members and friends of the OSU community; recognizes the significant contributions to research by OSU undergraduates; and facilitates exchange between students, faculty, and the public. Students enrolled in any undergraduate degree program in College of Food, Agricultural, and Environmental Sciences and the School of Environment and Natural Resources are invited to participate, provided they have a CGPA of 2.5 or higher and are engaged in supervised research projects in the area of their major. Posted by Emily Wickham at 9:43am March 15, 2019 Bookmark the permalink.